Sumatra coffees continue to amaze. Aside from Ethiopia, I can think of no other origin currently producing fine coffees displaying as much sheer range and distinction of sensory association. But whereas Ethiopia’s range of sensory surprise is owing to a rich store of ancient plant varieties, Sumatra’s range and diversity of sensation is primarily achieved through what would seem to be some simple variations in processing, meaning the sequence of steps in removing the fruit from the bean and drying it. Those interested in the history of this process, now generally called “wet-hulling” in English (“giling basah” in local Batak languages) might want check out our review article on Sumatras posted in 2010: Mysterious No More: Sumatra Coffees. The trend that we predicted (or hoped for) in that article appears to have happened. Wet-hulling, a traditional practice thoroughly embedded in the northern Sumatra coffee supply chain for decades, going on centuries, is increasingly better understood and undergoing refinement by key players along the chain, so what were haphazard successes associated with the practice have become more deliberate and controlled, with often spectacular results. When I first saw the wet-hulling process back in 1996, peasant farmers would rather sloppily remove the coffee skins, ferment and wash the beans, often not very thoroughly, and dry them on tarpaulins along the road for a few hours until a collector, or middle-person, drove by in a truck to pick up the wet parchment coffee. The collector then reassumed the drying process at a local mill. At this point the trick occurred: rather than waiting until the parchment coffee achieved a stable moisture content of 12% or so to remove the dry parchment skin, as is done everywhere else in the coffee world, the parchment skin was removed from the still moist, elastic beans at a moisture content of anywhere from 20% to 40% using specially designed hulling machines. (Hence the term “wet-hulled.”) Following that, the beans were dried to a shipping moisture of 12% to 13%, often in two stages, first at the collector’s mill and then down in the port city of Medan. Somewhere along the line, probably during the prolonged serial steps in drying, the beans picked up a slight mustiness which contributed the characteristic fruit-toned “earthiness” for which Sumatras are famous. The problem up to ten years ago was finding specific lots of Sumatra that expressed this accidental flavor complex sweetly and richly rather than harshly; in other words, finding lots that tasted richly earthy rather than overbearingly musty. However, in the years since about 2008 or so, various key players along the supply chain apparently have been refining and perfecting the wet-hulling process, with the result that the majority of the wet-hulled Sumatras we tested for this month’s article expressed the wet-hulled character with impressive vivacity and originality. Common to all was a prominent pungent character that deepened and grounded the profiles; at times one could call it earthy in the sense of sweet humus or moist fresh-fallen leaves; more often it provoked associations like moist pipe tobacco, fresh-cut cedar or fir, mango, or spice notes like nutmeg, cinnamon or pink peppercorn. Floating atop this pungent base were fruit notes, sometimes floral notes, with the whole aromatic package supported by a cleanly expressed structure of sweet-toned acidity and syrupy mouthfeel. True, many of the traditional Sumatras we tested were the more familiar old-fashioned style usually marketed as “Sumatra Mandheling,” displaying a hearty but rather heavy musty character that one sometimes had to stretch to call earthy. But these older-style Sumatras were out-numbered by the newer refined examples of the type: about half of the wet-hulled samples we tested scored 90 or higher. Compare this with the result in 2010, when fewer than 19% scored 90 or better. What are the refinements that appear to be transforming edgy earthy into spicy pungent? According to Max Fulmer of importer Royal Coffee in Emeryville, California, they most likely include better processing and fruit selection processes at the small producer level, more careful drying practices, more precise timing of the hulling at around 20% moisture, and above all better handling and faster shipping of finished coffee. In Sumatra, as elsewhere in the coffee world, producers are experimenting with processing methods not typical of the region. In particular, we had four full dried-in-the-fruit or “natural” coffees from Wahana Estate, a large farm founded in 2005. The Wahana mission statement declares the intention of producing coffees using three different processing methods, fully washed, semi-washed, and dried-in-the-fruit or natural. Since then, however, we have not seen much in the way of Wahana washed or semi-washed in the American or Asian specialty markets, but the Wahana Estate natural seems to have won some support. The four Wahana Estate naturals we tested, all from different roasters, averaged over 91; two are reviewed here at 93 and 92. They expressed a complex dried-in-the-fruit character different from either the lushly fruity, brandy-toned naturals associated with some producers in Ethiopia and Central America or the crisp, nut-and-chocolate style familiar from Brazil. The fermenty edge to the fruit was apparent, but it was backgrounded, one strand in a very complex layering of fruit with hints of dry, savory notes. Whether Wahana will be able to sustain this quality in their naturals remains to be seen. Earlier versions we reviewed in 2010 were interesting coffees, but considerably wilder, edgier and less disciplined than the samples we tested this month. It appears we received only one conventionally wet-processed coffee, the Parisi Sumatra Mandheling Washed reviewed here at 90. 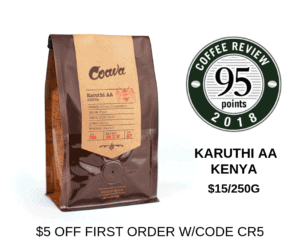 We included it in our reviews mainly because it was the only explicitly identified washed coffee we received and we thought that the difference in character between its pleasing but relatively simple profile and the distinctive complexity of the best of the traditional Sumatra wet-hulled coffees might be instructive.